Any dog, no matter what breed, would benefit from being involved in agility. Agility not only exercises the body, but it also refreshes and stimulates the mind. Not to mention, the added exercise can be beneficial to a dog owner’s waistline. In order to do this, we visited thrift stores, a plumbing supply store, a bicycle shop and toy store. 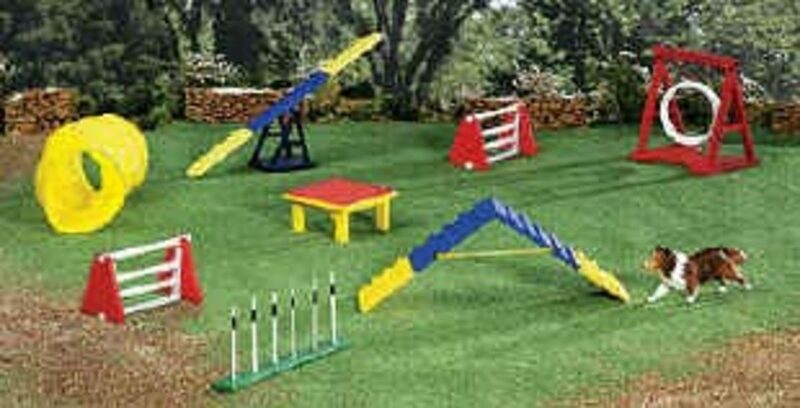 After we were finished, we were able to put together weave poles, 1 tire jump, a standard jump, pause table, teeter board and tunnel. I have lined out each project, so that you can decide what you want to build depending on the space you have available.